If you choose to seek a second opinion or initial consultation, Dr. Alden will perform a full evaluation, to confirm your diagnosis and help you understand all of the treatment options available to you. Patients and medical professionals from America and around the world seek out Dr. Alden’s specialized best in class individualized cancer treatments (and services) including his expert surgical management of the patient’s unique condition. 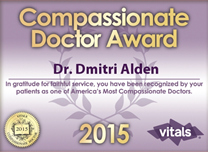 Patients referred to Dr. Dmitri Alden have access to a vast array of specialists who are some of the best in their field in the country (and possibly in the world). Skype/telephone report on findings can be arranged. Dr. Alden has dedicated his life to the war on liver cancer and pancreatic cancer. Dr, Alden has performed well over 3500 surgeries in the past 15+ years. At the forefront of medical innovation, he is a liver and cancer specialist who treats the most complex cancers using only the most advanced surgical procedures and technologies. For more information please feel free to contact Dmitri Alden, MD, FACS, today by phoning his New York City office (212) 434-6216 or emailing the surgeon directly using the eForm on the right.